At least 88 people have been killed, and 200 others injured in Egypt's deadliest attacks since 1997. Three car bombs exploded in quick succession in the Red Sea resort of Sharm El Sheikh early Saturday, ripping through a hotel and a coffee shop full of European and Egyptian tourists, reported the Egyptian news channel, NILE TV. One of the explosives-laden cars smashed through security into the front driveway of the Ghazala Gardens and detonated. The second car bomb exploded in a parking area near the Movenpick Hotel, also in Naama Bay. The third detonated at a minibus park in the Old Market, an area about 2.5 miles away where many Egyptians and others who work in the resorts live. The blast ripped through a nearby outdoor coffee shop, killing 17 people, believed to be Egyptians. Speaking to the Nile News Channel, Egyptian Tourism Minister Ahmed al Maghrabi said the attacks were “meant to terrorise people and prevent them from moving and travelling”. He vowed they would not hurt Egypt's crucial tourism industry. Thirteen Italians, eight British nationals, three Spaniards, three Saudis, a Ukrainian, a Russian, a Turk and an Israeli are among the wounded, but most of them are Egyptians, said Hala al-Khatib, a spokesman for Egypt's tourism ministry. Today's bombings were Egypt's deadliest since 1997, when Islamic militants killed 58 foreign tourists and four Egyptians at the Pharaonic Temple of Hatshepsut outside Luxor in southern Egypt. Sharm El Sheikh bombings was the last major terror attack in Egypt for years, until last October's bombings at hotels in the Sinai resorts of Taba and Ras Shitan, about 100 miles northwest of Sharm on the Israel border. Egyptian President Hosni Mubarak has cut short his vacation to visit the scene of the attacks, which happened on a national holiday marking the 1952 Egyptian Revolution. The president headed to Ghazala Hotel, one of the sites hit by the blasts in Naama Bay, the main strip where most of luxury hotels are located. Interior Minister Habib al-Adli and Health Minister Mohamed Awad Tag Eddin briefed Mubarak on circumstances of the explosions and measures that have been taken so far to deal with the situation. The Egyptian security authorities have stepped up security measures inside and outside Cairo International airport following the explosions. Reuters quoted Egypt's tourism minister expressing his concern that the Sharm al-Sheikh blasts will have a negative impact on tourism in the short term. Thousands of tourists are drawn to Sharm for its sun, clear blue water and coral reefs. It also has been a meeting place where world leaders have tried to hammer out a Mideast peace agreement. Egypt's $6.6 billion tourism industry is based on Red Sea resorts. Tourism is a major source of revenue and employment. In 2004, the country received a record 8.1 million visitors and in the first three months of 2005, the number of tourist visitors grew in comparison to the same period last year. According to Reuters, the tourism industry is Egypt's biggest private sector employer and took years to recover from the 1997 attack on Luxor which killed 58 tourists. However, the sector proved to be resilient following last October's bombings in the Sinai Peninsula which left 34 dead. A group calling itself the Abdullah Azzam Brigades, al Qaida, in Syria and Egypt, claimed responsibility for the attacks in a statement posted on an Islamist Web site. The group said that its “holy warriors targeted the Ghazala Gardens hotel and the Old Market in Sharm El Sheikh”. The authenticity of the statement could not be verified. 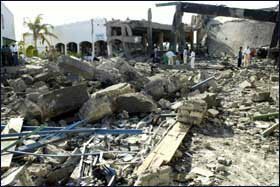 The brigades were one of two Islamist groups that claimed responsibility for the October 7 bombings at Sinai Peninsula Taba and Ras Shitan that killed 34 people. “Your brothers, the holy warriors of the martyr Abdullah Azzam Brigades succeeded in launching a smashing attack on the Crusaders, Zionists and the renegade Egyptian regime in Sharm El Sheikh,” said the statement. “We reaffirm that this operation was in response to the crimes committed by the forces of international evil, which are spilling the blood of Muslims in Iraq, Afghanistan and Chechnya. “We declare it loud and clear that we will not be frightened by the whips of the Egyptian torturers and we will not tolerate violation of our brothers' land of Sinai,” the statement added in an apparent reference to tourists who travel from neighbouring Israel to Sinai Peninsula for holidays. The Abdullah Azzam Brigades are apparently named after Abdullah Azzam, a Palestinian militant who led Islamic militants in Afghanistan and was killed in 1989 by a roadside bomb, and was regarded as the one-time “spiritual mentor” of al Qaida chief Osama bin Laden.